This article is about a city. For the province where it is located, see Herat Province. Herāt (Persian: هرات), classically called the Aria, is a major city in western Afghanistan, in the province also known as Herāt. It is situated in the valley of the Hari River, which flows from the mountains of central Afghanistan to the Karakum Desert in Turkmenistan. It is the third largest city of Afghanistan, with a population of 397,500. Persian-speaking Tajiks are the main inhabitants of the city, and are roughly the same as the Persians of Eastern Iran. Situated in a fertile area, Herāt was traditionally known for its wine. It is a very old city with many historic buildings, although these have suffered damage in various military conflicts during the last few decades. The city is dominated by the remains of a citadel constructed by Alexander the Great. During the Middle Ages Herāt became one of the important cities of Khorasan, it was known as the Pearl of Khorasan. Herāt lies on the ancient trade routes of the Middle East, Central and South Asia. The roads from Herāt to Iran, Turkmenistan, Mazar-e Sharif and Kandahar are still strategically important. The city is the gateway to Iran, collecting the highest amount of customs revenue for Afghanistan. The winter is tolerably mild; snow melts as it falls, and even on the mountains does not lie long. Three years out of four it does not freeze hard enough for the people to store ice. The eastern reaches of the Hari River, including the rapids, are frozen hard in the winter, and people travel on it as on a road. The population of Herat numbers 397,500. Persian-speaking Tajiks form the overwhelming majority of the city, comprising ca. 85% of the population. Pashtuns (10%), Hazaras (2%), Uzbeks (2%), and Turkmens (1%) form sizable minorities. The native language of Herat belongs to the Khorāsānī cluster within Persian and is akin to the Persian dialects of eastern Iran, notably that of Mashhad and Iranian Khorasan. In recent years the Hazara population has increased in Herat city making around 12% of the total population in this province. During the period of the Median Empire (about 600 BCE) and the Achaemenid Empire (ca. 550-330 BC), Herāt was often recognized as Aria. According to a recent study by German archeologists, Herat is believed to be 2,700 years old. During the period of the Achaemenid Empire (ca. 550-330 BC), the surrounding district was known as Haraiva (in Old Persian), and in classical sources the region was correspondingly known as Aria (Areia). In the Zoroastrian Avesta, the district is mentioned as Haroiva. The name of the district and its main town is derived from that of the chief river of the region, the Hari River (Old Iranian Harayu, "Golden Water"), which traverses the district and passes some 5 km (3.1 mi) south of modern Herāt. Hari is mentioned in Sanscrit as yellow or golden color equivalent to Persian Zar meaning Gold (yellow). The naming of a region and its principal town after the main river is a common feature in this part of the world—compare the adjoining districts/rivers/towns of Arachosia and Bactria. The district Aria of the Persian Achaemenid Empire is mentioned in the provincial lists that are included in various royal inscriptions, for instance, in the Behistun inscription of Darius I (ca. 520 BC). Representatives from the district are depicted in reliefs, e.g., at the royal Achaemenid tombs of Naqsh-e Rustam and Persepolis. Herodotus described Herāt as the bread-basket of Central Asia. At the time of Alexander the Great, Aria was obviously an important district. It was administered by a satrap called Satibarzanes, who was one of the three main Persian officials in the East of the Empire, together with the satrap Bessus of Bactria and Barsaentes of Arachosia. In late 330 BC, Alexander the Great captured the Arian capital that was called Artacoana. The town was rebuilt and the citadel was constructed. It became part of the Seleucid Empire but was captured by others on various occasions and became part of the Parthian Empire in 167 BC. In the Sasanian period (226-652), Harēv is listed in an inscription on the Ka'ba-i Zartosht at Naqsh-e Rustam; and Hariy is mentioned in the Pahlavi catalogue of the provincial capitals of the empire. In around 430, the town is also listed as having a Christian community, with a Nestorian bishop. In the last two centuries of Sasanian rule, Aria (Herāt) had great strategic importance in the endless wars between the Sasanians, the Chionites and the Hephthalites who had been settled in modern northern Afghanistan since the late fourth century. The famous Friday Mosque of Herat or Juma Mosque, located roughly in the center of the city. The city of Herāt became well known with the advent of the Arabs in the middle of the seventh century. When the Arab armies appeared in Khorasan in the 650s, Herāt was counted among the twelve capital towns of the Sasanian Empire. Herāt was taken in AD 652 by General Abdul Rehman ibn Samrah. Around 786-809, Herāt was part of the Abbasid Caliphate, later, it was ruled by the Tahirid dynasty, and after 867-869, the Saffarid dynasty took control. Herāt was under the rule of King Nuh III of Samanid the seventh of the Samanid line—at the time of Sebük Tigin and his older son, Mahmud of Ghazni. The governor of Herāt was a noble by the name of Faik, who governed on behalf of Nuh III. Faik was a powerful, but insubordinate governor of Nuh III; and had been punished by Nuh III. Faik made overtures to Bogra Khan and Ughar Khan of Turkestan. Bogra Khan answered Faik's call, came to Herāt and became its master. The Samanids fled, betrayed at the hands of Faik to whom the defence of Herāt had been entrusted by Nuh III. In 994, Nuh III invited Alp Tigin to come to his aid. Alp Tigin, along with Mahmud of Ghazni, defeated Faik and annexed Herāt, Nishapur and Tous. Before 1040, Herāt was ruled by the Ghaznavids. In 1040, it was captured by the Seljuk Empire. Yet, in 1175, it was captured by the Ghorids and then came under the Khawarazm Empire. In this period Herāt became an important center for the production of metal goods, especially in bronze, often decorated with elaborate inlays in precious metals. Herāt was captured by the Mongols in 1221 and destroyed by Genghis Khan. The city was given to one of Genghis Khan's sons, Tuli, but the locals revolted and killed the Mongol garrison. After hearing the news, Genghis Khan rode furiously upon the city with 80,000 soldiers and besieged it for about six months, killing everyone except some forty. In 1245, it was given to the Kart Maliks. Around 1381, the city was destroyed again by Timur. Under his son Shah Rukh Herāt was rebuilt and became an important center under the Timurid Empire. In the late 1400s, the Musallah complex, with many minarets, was built under the rule of Queen Gawharshad. Her tomb complex is considered one of the great monuments of Timurid architectural carving. The Black Sheep Turkomans (Qara Qoyunlu) at one point established their capital in Herāt during the fifteenth century, and in 1506 it was captured by the Uzbeks. Only few years later the city was taken by Shah Ismail Safavi, to become part of a new Safavid Persian Empire. Mughal Emperor Babur, who had his first drink of wine in Herat, visited the city in early 1500s but decided to abandon it. In 1710 the city fell to Mirwais Khan Hotak and was ruled by the Ghilzai Afghans until 1736 when Nader Shah Afsharid swept through with his Afsharid forces. After Nader Shah's death in 1747, Ahmad Shah Durrani took possession of Herāt after almost a year of siege and bloody conflict, and the city became part of the Durrani Empire. In 1824, the city became independent for several years when the Empire was split between the Durranis and the Barakzais. Qajars of Persia tried to take city from Durranis in 1852 and again in 1856; both times the British helped to repel the Persians, the second time through the Anglo-Persian War. The city fell to Dost Mohammad Khan of the Barakzai dynasty in 1863. Most of the Musallah complex in Herat was cleared in 1885 by the British army to get a good line of sight for their artillery against Russian invaders who never came. This was but one small sidetrack in the Great Game, a century-long conflict between the British Empire and the Russian Empire in 19th century. During the Democratic Republic of Afghanistan, Herat Airport was used by the Soviet forces. Even before the Soviet invasion at the end of 1979, there was a substantial presence of Soviet advisors in the city with their families. From 10 to 20 March 1979 the army in Herāt under the control of Ismail Khan mutinied. Reprisals by the Afghan government followed, and between 3000 and 5000 people were killed. City itself was recaptured with tanks and airborne forces. Ismail Khan became the leading Mujahedin commander in Herāt. After the departure of the Soviets, he became governor of Herāt. In September 1995 the city was captured by the Taliban without much resistance, forcing Ismail Khan to flee. However, after the US invasion of Afghanistan, on November 12, 2001, it was liberated from the Taliban by the Northern Alliance and Ismail Khan returned to power (see Battle of Herat). In 2004, Mirwais Sadiq, Aviation Minister of Afghanistan and the son of Ismail Khan, was ambushed and killed in Herāt by a local rival group. More than 200 people were arrested under suspicion of involvement. Herāt is presently in full control of Afghanistan's new central government, led by Hamid Karzai, who was initially backed by the United States. The Afghan National Army and the Afghan National Police provide security in the city as well as the whole province. There are also presence of the International Security Assistance Force (ISAF) forces in the area, which is led by Italy and assisting the Military of Afghanistan. By 2009, Iran invested funds into Herāt. As a result, Herāt now enjoys 24-hour electricity, well-paved roads, and a higher sense of security than other Afghan cities. Some locals jokingly called Herāt the "Dubai of Afghanistan." In 2007, Iran and Afghanistan finalized an agreement for the establishment of a rail service between the two countries. Construction of the 191 km (119 mi) railway, from Khaf in Iran to Herāt, is in progress on the Iranian side of the border . There is also the prospect of an extension across Afghanistan to Sher Khan Bandar. See railway stations in Afghanistan. Of the more than dozen minarets that once stood in Herāt, many have been toppled from war and neglect over the past century. Recently, however, everyday traffic threatens many of the remaining unique towers by shaking the very foundations they stand on. Cars and trucks that drive on a road encircling the ancient city rumble the ground every time they pass these historic structures.UNESCO personnel and Afghan authorities have been working to stabilize the Fifth Minaret. Valy hedjasi, Famous singer and composer. The beginning of Khaled Hosseini's 2007 novel A Thousand Splendid Suns is set in and around Herāt. Salman Rushdie's novel The Enchantress of Florence makes frequent reference to events in Herāt in the Middle Ages. ^ H. F. Schurmann, The Mongols of Afghanistan: an Ethnography of the Moghols and Related Peoples of Afghanistan. The Hague: Mouton, 1962: ; p. 75: "... the Tajiks of Western Afghanistan [are] roughly the same as the Khûrâsânî Persians on the other side of the line ..."
^ Pajhwok Afghan News, Archaeologists say Herat 2,700 years old, October 8, 2009. ^ Translated by Herbert Cushing Tolman. "The Behistan Inscription of King Darius". Vanderbilt University, Nashville, Tennessee. http://mcadams.posc.mu.edu/txt/ah/Persia/Behistun_txt.html. ^ a b The heart of Asia: a history of Russian Turkestan and the Central Asian Khanates from the earliest times By Francis Henry Skrine, Edward Denison RossEdition: illustrated Published by Routledge, 2004 Page 117 ISBN 0700710175, 9780700710171. ^ Skrine, Francis Henry; Ross, Edward Denison (2004). The heart of Asia: a history of Russian Turkestan and the Central Asian Khanates from the earliest times. Routledge. pp. 117. ISBN 9780700710171. ^ Patrick Clawson (2005). Eternal Iran. Palgrave Macmillan. p. 23. ISBN 1-4039-6276-6. ^ "More arrests after Herat killing". BBC News. 2004-03-25. http://news.bbc.co.uk/2/hi/south_asia/3567277.stm. ^ Motlagh, Jason. "Iran's Spending Spree in Afghanistan." TIME. Wednesday May 20, 2009. Retrieved on May 24, 2009. ^ Bendeich, Mark (June 25, 2007). "Cars, Not War, Threaten Afghan Minarets". Islam Online. http://ww1.islamonline.net/servlet/Satellite?c=Article_C&cid=1182697507391&pagename=Zone-English-ArtCulture%2FACELayout. Retrieved 2009-09-24. ^ Podelco, Grant (July 18, 2005). "Afghanistan: Race To Preserve Historic Minarets of Herat, Jam". Radio Free Europe/Radio Liberty. http://www.rferl.org/content/article/1059997.html. Retrieved 2009-09-24. A satellite view map of Herāt. Herat (Persian: هرات) is a big, relatively wealthy city in western Afghanistan. The city is well developed because of trade with Iran and in a good shape compared to other Afghan cities. The people are very friendly and hospitable to foreigners and are also more religious than people in Kabul. No tourism exists in Herat but there is a small community of foreign workers from Europe or other western countries who are easy to contact by asking at the German or Indian consulate or hanging around in the Marco Polo Hotel. The small airport is 15km south of the city. Daily flights are operated from Kabul by Kam Air and Ariana for 3200 Afg / $65, and the UN operates some flights as well. Pamir Airways is a new carrier, flying daily between Kabul and Herat. The road from Kandahar has been rebuilt but is very dangerous through Helmand and Farah. The road from Iran is reported to be good. The road from Turkmenistan is tarred and in good condition (save for a few bomb craters). There are occasional security incidents as trouble spills over from unstable Badghis province. Get up-to-date advice before attempting this route. The road from Mazar-e Sharif via Maimana is being upgraded but a section through Badghis province has yet to be completed, largely due to the kidnapping of the construction team in April 2009. This route is not recommended. The central route to Kabul via Chagcheran and the Minaret of Jam is a very rough 3-6 day journey, sleeping in chaikanas along the way. Several travelers have recently done this route and reported no safety issues. However, from Bamiyan it is currently advisable to take the longer northern route to Kabul, as the southern route is of questionable safety. The Friday Mosque is more than 800 years old, full of life and incredibly beautiful. Its minarets dominate the old town. The Citadel is in on a hill to the west of the old city, with great views overlooking the city. It has recently reopened to visitors after being used by the military to store ammunition for the last few years. It has a great and eerie deserted feel, and you're free to roam and climb around all you want - however, be a little careful, some of the paths are slightly precarious. On the way out the guards may try and stab you with a $5 entrance fee, which they have tickets to back up... this is an outrageous fee, and you can get by with $1 or $2 if you're willing to argue, which you should. Musalla Complex, about 2 km due north of the Citadel. Once a collection of minarets, a mosque and a medressa, all that remains is 1 minaret with a hole blown out of one side, leaning at a precarious angle and supported by cables. Near this is the large domed tomb of Gowhar Shad, who commissioned the original complex. Minarets of Sultan Baiqara, next to the Musalla Complex. The 4 minarets are all that remains of the medressa that he built. The new Iranian-built road cuts directly through them, two on each side. Most of the once beautiful blue tiling has vanished. Tomb of Jami. Jami was a very famous 15th century sufi poet. His tomb is highly revered, and popular with local women. To get here, walk roughly a kilometre north from the Baiqara minarets along the main road. When you get to a junction with a large monument in the center, look out to the left and the large building that looks like a mosque is the one. There is a taxi stand near the junction if your out of steam or heading to Gazar Gah (50 Afg) or Takht-e Safar. Gazar Gah is the large and famous sufi shrine of Khoja Abdullah Ansari. His tomb is the large blue structure at the back. There is no entrance fee, but donations are appreciated. Takht-e Safar, a very old and famous park situated near the mountain close to Gazar Gah. Take a shower in the huge subterranean Hammans. There are several antique shops on the north side of the mosque that sell jewelry, tea pots, old coins, traditional clothing, etc. Bargain hard and in Afghanis! There are money changers near Chowk Gulha and along Bagh-e Azadi, north of the old city. Western Union , Bagh-e Azadi, near Da Afghanistan Bank. Afghanistan International Bank (AIB) , Bagh-e Azadi. This location has an ATM but is closed on Fridays. Kabul Bank  has a branch in Herat. It also has western union services. Chaikanas are plentiful, and serve cheap local Afghani food. Shahiste Restaurant, jad-e Badmurghan, is in the Marco Polo Hotel and is the best restaurant in the city. Menu changes daily, and usually features several Iranian/Afghani options. Meals from around 70Af. Fardeen Supermarket, jad-e Ghomandani, about two blocks north of Bagh-e Azadi. A well-stocked supermarket with plenty of western and Iranian imports. Jaam Hotel, in the old city west of Darb Khosh, +93 (0) 40 223 477. Has 30 very basic double rooms, all sharing 2 squat toilets and 2 showers. Management speaks some English and is very friendly, and there is a restaurant on site. 300 Afg / $6. Marco Polo Hotel, jad-e Badmurghan, +93 (0) 40 221 944. is the most popular "western standards" hotel in the city. Rooms cost $30-$40 per night and include internet access. Park Hotel, just south of Girdha Park on the road from the airport, +93 (0) 40 223 010. This old hotel has recently reopened as a hotel after being occupied by the military. It's currently still very empty, and has a faded, grand old haunted house feel. Large, high-ceiling rooms have 3 single beds and large tiled bathrooms with western toilets. Surrounded by trees on secure grounds. 1000 Afg for 1 person, 2000 Afg for 3 people. Baharistan Hery Hotel, Baad Murghan, (in the Arefi Business center), +93-040-70407859, 798280942, baharistan_hery@yahoo.com. A new western-style hotel located on the same street as the Marco Polo Hotel. Double rooms cost $30 with breakfast, internet and heating system. Hotel has plenty of room and a terrace with views of the whole city. Staff is very helpful. Nazary Hotel, Walatay St.  +93(0)799 345100, 795 606400. A new Dubai-esque tower block on the main east-west street. Rack rates are around $60 for an en suite double but discounts are available. Rooms have a/c, heating, satellite TV and LAN internet. Herat is one of the safer cities in Afghanistan. However, there are sometimes small explosions attributed to political parties which are trying to make a point or create the impression that the city is not safe. Shootings are also common during personal disputes. Gun battles between the Afghan National Army and Afghan National Police are not unusual. Be quiet, respectful and dress appropriately when visiting mosques and shrines. These are holy places of worship and should not be treated as tourist attractions. Be discreet with your camera. HERAT, a city and province of Afghanistan. The city of Herat lies in 34° 20' 30" N., and 62° 11' o" E., at an altitude of 2500 ft. above sea-level. Estimated pop. about io,000. It is a city of great interest historically, geographically, politically and strategically, but in modern days it has quite lost its ancient commercial importance. From this central point great lines of communication radiate in all directions to Russian, British, Persian and Afghan. territory. Sixty-six miles to the north lies the terminus of the Russian railway system; to the south-east is Kandahar (360 m.) and about 70 m. beyond that, New Chaman, the terminus of the British railway system. 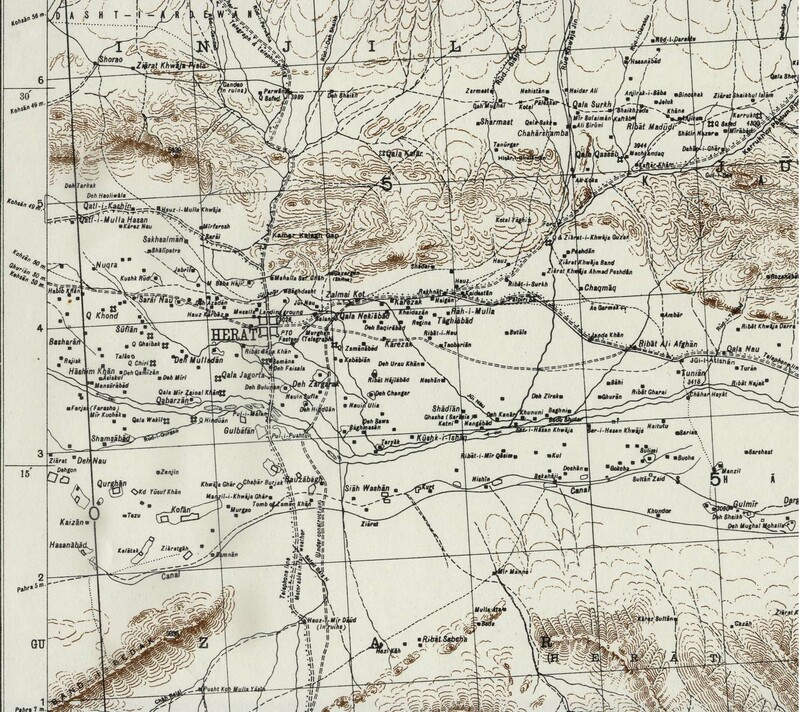 Southward lies Seistan (200 m.), and eastward Kabul (550 m.); while on the west four routes lead into Persia by Turbet to Meshed (215 m.), and by Birjend to Kerman (400 m.), to Yezd (500 m.), or to Isfahan (boo m.). The city forms a quadrangle of nearly i m. square (more accurately about 1600 yds. by r Soo yds. ); on the western, southern and eastern faces the line of defence is almost straight, the only projecting points being the gateways, but on the northern face the contour is broken by a double outwork, consisting of the Ark or citadel, which is built of sundried brick on a high artificial mound within the enceinte, and a lower work at its foot, called the Ark-i-nao, or " new citadel," which extends ioo yds. beyond the line of the city wall. That which distinguishes Herat from all other Oriental cities, and at the same time constitutes its main defence, is the stupendous character of the earthwork upon which the city wall is built. This earthwork averages 250 ft. in width at the base and about 50 ft. in height, and as it is crowned by a wall 25 ft. high and 14 ft. thick at the base, supported by about r so semicircular towers, and is further protected by a ditch 45 ft. in width and 16 in depth, it presents an appearance of imposing strength. When the royal engineers of the Russo-Afghan Boundary Commission entered Herat in 1885 they found its defences in various stages of disrepair. The gigantic rampart was unflanked, and the covered ways in the face of it subject to enfilade from end to end. The ditch was choked, the gates were unprotected; the tumbled mass of irregular mud buildings which constituted the city clung tightly to the walls; there were no gun emplacements. Outside, matters were almost worse than inside. To the north of the walls the site of old Herat was indicated by a vast mass of debris - mounds of bricks and pottery intersected by a network of shallow trenches, where the only semblance of a protective wall was the irregular line of the Tal-i-Bangi. South of the city was a vast area filled in with the graveyards of centuries. Here the trenches dug by the Persians during the last siege were still in a fair state of preservation; they were within a stone's-throw of the walls. Round about the city on all sides were similar opportunities for close approach; even the villages stretched out long irregular streets towards the city gates. To the north-west, beyond the Tal-i-Bangi, the magnificent outlines of the Mosalla filled a wide space with the glorious curves of dome and gateway and the stately grace of tapering minars, but the impressive beauty of this, by far the finest architectural structure in all Afghanistan, could not be permitted to weigh against the fact that the position occupied by this pile of solid buildings was fatal to the interests of effective defence. By the end of August 1885, when a political crisis had supervened between Great Britain and Russia, under the orders of the Amir the Mosalla was destroyed; but four minars standing at the corners of the wide plinth still remain to attest to the glorious proportions of the ancient structure, and to exhibit samples of that decorative tilework, which for intricate beauty of design and exquisite taste in the blending of colour still appeals to the memory as unique. At the same time the ancient graveyards round the city were swept smooth and levelled; obstructions were demolished, outworks constructed, and the defences generally renovated. Whether or no the strength of this bulwark of North-Western Afghanistan should ever be practically tested, the general result of the most recent in vestigations into the value of Herat as a strategic centre has been largely to modify the once widely-accepted view that the key to India lies within it. Abdur Rahman and his successor Habibullah steadfastly refused the offer of British engineers to strengthen its defences; and though the Afghans themselves have occasionally undertaken repairs, it is doubtful whether the old walls of Herat are maintained in a state of efficiency. The exact position of Herat, with reference to the Russian station of Kushk (now the terminus of a branch railway from Merv), is as follows: From Herat, a gentle ascent northwards for 3 m. reaches to the foot of the Koh-i-Mulla Khwaja, crossing the Jui Nao or " new " canal, which here divides the gravelcovered foot hills from the alluvial flats of the Hari Rud plain. The crest of the outer ridges of this subsidiary range is about 700 ft. above the city, at a distance of 4 m. from it. For 28 m. farther the road winds first amongst the broken ridges of the Koh-i-Mulla Khwaja, then over the intervening dasht into the southern spurs of the Paropamisus to the Ardewan pass. This is the highest point it attains, and it has risen about 21 5 0 ft. from Herat. From the pass it drops over the gradually decreasing grades of a wide sweep of Chol (which here happens to be locally free from the intersecting network of narrow ravines which is generally a distinguishing feature of Turkestan loess formations) for a distance of 35 m. into the Russian railway station, falling some 2700 ft. from the crest of the Paropamisus. To the south the road from Herat to India through Kandahar lies across an open plain, which presents no great engineering difficulties, but is of a somewhat waterless and barren character. The city possesses five gates, two on the northern face, the Kutab-chak near the north-east angle of the wall, and the Malik at the re-entering angle of the Ark-i-nao; and three others in the centres of the remaining faces, the Irak gate on the west, the Kandahar gate on the south and the Kushk gate on the east face. Four streets called the Chahar-sick, running from the centre of each face, meet in the centre of the town in a small domed quadrangle. The principal street runs from the south or Kandahar gate to the market in front of the citadel, and is covered in with a vaulted roof through its entire length, the shops and buildings of this bazaar being much superior to those of the other streets, and the merchants' caravanserais, several of which are spacious and well built, all opening out on this great thoroughfare. Near the central quadrangle of the city is a vast reservoir of water, the dome of which is of bold and excellent proportions. The only other public building of any consequence in Herat is the great mosque or Mesjid-i-Juma, which comprises an area of Boo yds. square, and must have been a most magnificent structure. It was erected towards the close of the 15th century, during the reign of Shah Sultan Hussein of the family of Timur, and is said when perfect to have been 465 ft. long by 275 ft. wide, to have had 4 08 cupolas,130 windows, 444 pillars and 6 entrances, and to have been adorned in the most magnificent manner with gilding, carving, precious mosaics and other elaborate and costly embellishments. Now, however, it is falling rapidly into ruin, the ever-changing provincial governors who administer Herat having neither the means nor the inclination to undertake the necessary repairs. Neither the palace of the Charbagh within the city wall, which was the residence of the British mission in 1840-1841, nor the royal quarters in the citadel deserve any special notice. At the present day, with the exception of the Chahar-sick, where there is always a certain amount of traffic, and where the great diversity of race and costume imparts much liveliness to the scene, Herat presents a very melancholy and desolate appearance. The mud houses in rear of the bazaars are for the most part uninhabited and in ruins, and even the burnt brick buildings are becoming everywhere dilapidated. The city is also one of the filthiest in the East, as there are no means of drainage or sewerage, and garbage of every description lies in heaps in the open streets. Along the slopes of the northern hills there is a space of some 4 m. in length by 3 m. in breadth, the surface of the plain, strewn over its whole extent with pieces of pottery and crumbling bricks, and also broken here and there by earthen mounds and ruined walls, the debris of palatial structures which at one time were the glory and wonder of the East. Of these structures indeed some have survived to the present day in a sufficiently perfect state to bear witness to the grandeur and beauty of the old architecture of Herat. Such was the mosque of the Mosalla before its destruction. Scarcely inferior in beauty of design and execution, though of more moderate dimensions, is the tomb of the saint Abdullah Ansari, in the same neighbourhood. This building, which was erected by Shah Rukh Mirza, the grandson of Timur, over Soo years ago, contains some exquisite specimens of sculpture in the best style of Oriental art. Adjoining the tomb also are numerous marble mausoleums, the sepulchres of princes of the house of Timur; and especially deserving of notice is a royal building tastefully decorated by an Italian artist named Geraldi, who was in the service of Shah Abbas the Great. The locality, which is further enlivened by gardens and running streams, is named Gazir-gah, and is a favourite resort of the Heratis. It is held indeed in high veneration by all classes, and the famous Dost Mahommed Khan is himself buried at the foot of the tomb of the saint. Two other royal palaces named respectively Bagh-i-Shah and Takht-i-Sefer, are situated on the same rising ground somewhat farther to the west. The buildings are now in ruins, but the view from the pavilions, shaded by splendid plane trees on the terraced gardens formed on the slope of the mountain, is said to be very beautiful. The population of Herat and the neighbourhood is of a very mixed character. The original inhabitants of Ariana were no doubt of the Aryan family, and immediately cognate with the Persian race, but they were probably intermixed at a very early period with the Sacae and Massagetae, who seem to have held the mountains from Kabul to Herat from the first dawn of history, and to whom must be ascribed - rather than to an infusion of Turco-Tartaric blood introduced by the armies of Jenghiz and Timur - the peculiar broad features and flattish countenance which distinguish the inhabitants of Herat, Seistan and the eastern provinces of Persia from their countrymen farther to the west. Under the government of Herat, however, there are a very large number of tribes, ruled over by separate and semi-independent chiefs, and belonging probably to different nationalities. The principal group of tribes is called the ChaharAimak, or " four races," the constituent parts of which, however, are variously stated by different authorities both as to strength and nomenclature. The Heratis are an agricultural race, and are not nearly so warlike as the Pathans from the neighbourhood of Kabul or Kandahar. The long narrow valley of the Hari Rud, starting from the western slopes of the Koh-i-Baba, extends almost due west for 300 m. before it takes its great northern bend at Kuhsan, and passes northwards through the broken ridges of the Siah Bubuk (the western extremity of the range which we now call Paropamisus) towards Sarakhs. For the greater part of its length it drains the southern slopes only of the Paropamisus and the northern slopes of a parallel range called Koh-i-Safed. The Paropamisus forms the southern face of the Turkestan plateau, which contains the sources of the Murghab river; the northern face of the same plateau is defined by the Band-i-Turkestan. On the south of the plateau we find a similar succession of narrow valleys dividing parallel flexures, or anticlinals, formed under similar geological conditions to those which appear to be universally applicable to the Himalaya, the Hindu Kush, and the Indus frontier mountain systems. From one of these long lateral valleys the Hari Rud receives its principal tributary, which joins the main river below Obeh, 180 m. from its source; and it is this tributary (separated from the Hari Rud by the narrow ridges of the Koh-i-Safed and Band-iBaian) that offers the high road from Herat to Kabul, and not the Hari Rud itself. From its source to Obeh the Hari Rud is a valley of sandy desolation. There are no glaciers near its sources, although they must have existed there in geologically recent times, but masses of melting snow annually give rise to floods, which rush through the midst of the valley in a turbid red stream, frequently rendering the river impassable and cutting off the crazy brick bridges at Herat and Tirpul. It is impossible, whilst watching the rolling, seething volume of flood-water which swirls westwards in April, to imagine the waste stretches of dry river-bed which in a few months' time (when every available drop of water is carried off for irrigation) will represent the Hari Rud. The soft shales or clays of the hills bounding the valley render these hills especially subject to the action of denudation, and the result, in rounded slopes and easily accessible crests, determines the nature of the easy tracks and passes which intersect them. At the same time, any excessive local rainfall is productive of difficulty and danger from the floods of liquid mud and loose boulders which sweep like an avalanche down the hill sides. The intense cold which usually accompanies these sudden northern blizzards of Herat and Turkestan is a further source of danger. From Obeh, 50 m. east of Herat, the cultivated portion of the valley commences, and it extends, with a width which varies from 8 to 16 m., to Kuhsan, 60 m. west of the city. But the great stretch of highly irrigated and valuable fruit-growing land, which appears to spread from the walls of Herat east and west as far as the eye can reach, and to sweep to the foot of the hills north and south with an endless array of vineyards and melon-beds, orchards and villages, varied with a brilliant patchwork of poppy growth brightening the width of green wheat-fields with splashes of scarlet and purple - all this is really comprised within a narrow area which does not extend beyond a ten-miles' radius from the city. The system of irrigation by which these agricultural results are attained is most elaborate. The despised Herati Tajik, in blue shirt and skull-cap, and with no instrument better than a three-cornered spade, is as skilled an agriculturist as is the Ghilzai engineer, but he cannot effect more than the limits of his water-supply will permit. He adopts the karez (or, Persian, kandt) system of underground irrigation, as does the Ghilzai, and brings every drop of water that he can find to the surface; but it cannot be said that he is more successful than the Ghilzai. It is the startling contrast of the Herati oasis with the vast expanse of comparative sterility that encloses it which has given such a fictitious value to the estimates of the material wealth of the valley of the Hari Rud. The valley about Herat includes a flat alluvial plain which might, for some miles on any side except the north, be speedily reduced to an impassable swamp by means of flood-water from the surrounding canals. Three miles to the south of the city the river flows from east to west, spanned by the Pal-i-Malun, a bridge possessing grand proportions, but which was in 1885 in a state of grievous disrepair and practically useless. East and west stretches the long vista of the Hari Rud. Due north the hills called the Koh-i-Mulla Khwaja appear to be close and dominating, but the foot of these hills is really about 3 m. distant from the city. This northern line of barren, broken sandstone hills is geographically no part of the Paropamisus range, from which it is separated by a stretch of sandy upland about 20 m. in width, called the Dasht-i-Hamdamao, or Dasht-i-Ardewan, formed by the talus or drift of the higher mountains, which, washed down through centuries of denudation, now forms long sweeping spurs of gravel and sand, scantily clothed with wormwood scrub and almost destitute of water. Through this stretch of dasht the drainage from the main water-divide breaks downwards to the plains of Herat, where it is arrested and utilized for irrigation purposes. To the north-east of the city a very considerable valley has been formed between the Paropamisus and the subsidiary Koh-i-Mulla Khwaja range, called Korokh. Here there are one or two important villages and a well-known shrine marked by a group of pine trees which is unique in this part of Afghanistan. The valley leads to a group of passes across the Paropamisus into Turkestan, of which the Zirmast is perhaps the best known. The main water-divide between Herat and the Turkestan Chol (the loess district) has been called Paropamisus for want of any well-recognized general name. To the north of the Korokh valley it exhibits something of the formation of the Hindu Kush (of which it is apparently a geological extension), but as it passes westwards it becomes broke: Environs of Herat. into fragments by processes of denudation, until it is hardly recognizable as a distinct range at all. The direct passes across it from Herat (the Baba and the Ardewan) wind amongst masses of disintegrating sandstone for some miles on each side of the dividing watershed, but farther west the rounded knolls of the rain-washed downs may be crossed almost at any point without difficulty. The names applied to this debris of a once formidable mountain system are essentially local and hardly distinctive. Beyond this range the sand and clay loess formation spreads downwards like a tumbled sea, hiding within the folds of its many-crested hills the twisting course of the Kushk and its tributaries. The origin of Herat is lost in antiquity. The name first appears in the list of primitive Zoroastrian settlements contained in the Vendidad Sade, where, however, like most of the names in the same list, - such as Sughudu (Sogdiana), Mouru (Mer y or Margus), Haraquiti (Arachotus or Arghand-ab), Haetumant (Etymander or Helmund), and Ragha (or Argha-stan),--it seems to apply to the river or river-basin, which was the special centre of population. This name of Haroyu, as it is written in the Vendidad,or Hariwa,as it appears in the inscriptions of Darius, is a cognate form with the Sanskrit Sarayu, which signifies " a river," and its resemblance to the ethnic title of Aryan (Sans. Arya) is purely fortuitous; though from the circumstance of the city being named " Aria Metropolis " by the Greeks, and being also recognized as the capital of Ariana, " the country of the Arians," the two forms have been frequently confounded. Of the foundation of Herat (or Heri, as it is still often called) nothing is known. We can only infer from the colossal character of the earth-works which surround the modern town, that, like the similar remains at Bost on the Helmund and at Ulan Robat of Arachosia, they belong to that period of Central-Asian history which preceded the rise of Achaemenian power, and which in Grecian romance is illustrated by the names of Bacchus, of Hercules and of Semiramis. To trace in any detail the fortunes of Herat would be to write the modern history of the East, for there has hardly been a dynastic revolution, or a foreign invasion, or a great civil war in Central Asia since the time of the prophet, in which Herat has not played a conspicuous part and suffered accordingly. Under the Tahirids of Khorasan, the Saffarids of Seistan and the Samanids of Bokhara, it flourished for some centuries in peace and progressive prosperity; but during the succeeding rule of the Ghaznevid kings its metropolitan character was for a time obscured by the celebrity of the neighbouring capital of Ghazni, until finally in the reign of Sultan Sanjar of Mer y about 1157 the city was entirely destroyed by an irruption of the Ghuzz, the predecessors, in race as well as in habitat, of the modern Turkomans. Herat gradually recovered under the enlightened Ghorid kings, who were indeed natives of the province, though they preferred to hold their court amid their ancestral fortresses in the mountains of Ghor, so that at the time of Jenghiz Khan's invasion it equalled or even exceeded in populousness and wealth its sister capitals of Balkh, Mery and Nishapur, the united strength of the four cities being estimated at three millions of inhabitants. But this Mogul visitation was most calamitous; forty persons, indeed, are stated to have alone survived the general massacre of 1232, and as a similar catastrophe overtook the city at the hands of Timur in 1398, when the local dynasty of Kurt, which had succeeded the Ghorides in eastern Khorasan, was put an end to, it is astonishing to find that early in the 15th century Herat was again flourishing and populous, and the favoured seat of the art and literature of the East. It was indeed under the princes of the house of Timur that most of the noble buildings were erected, of which the remains still excite our admiration at Herat, while all the great historical works relative to Asia, such as the Rozetes-Sefa, the Habib-es-seir, Hafiz Abru's Tarikh, the Mallet' a-esSa'adin, &c., date from the same place and the same age. Four times was Herat sacked by Turkomans and Usbegs during the centuries which intervened between the Timuride princes and the rise of the Afghan power, and it has never in modern times attained to anything like its old importance. Afghan tribes, who had originally dwelt far to the east, were first settled at Herat by Nadir Shah, and from that time they have monopolized the government and formed the dominant element in the population. It will be needless to trace the revolutions and counter-revolutions which have followed each other in quick succession at Herat since Ahmad Shah Durani founded the Afghan monarchy about the middle of the 18th century. Let it suffice to say that Herat has been throughout the seat of an Afghan government, sometimes in subordination to Kabul and sometimes independent. Persia indeed for many years showed a strong disposition to reassert the supremacy over Herat which was exercised by the Safawid kings, but great Britain, disapproving of the advance of Persia towards the Indian frontier, steadily resisted the encroachment; and, indeed, after helping the Heratis to beat off the attack of the Persian army in 1838, the British at length compelled the shah in 1857 at the close of his war with them to sign a treaty recognizing the further independence of the place, and pledging Persia against any further interference with the Afghans. In 1863 Herat, which for fifty years previously had been independent of Kabul, was incorporated by Dost Mahomed Khan in the Afghan monarchy, and the Amir, Habibullah of Afghanistan, like his father Abdur Rahman before him, remained Amir of Herat and Kandahar, as well as Kabul. [[File:|thumb|240px|Herat]] Herat (Persian: هرات, Herāt) is the second largest city of Afghanistan and capital of a province with the same name. It is located in the west of the country, close to the border of Iran. The spoken language of Herat is Perisan (Dari). Herat dates back to very old times. Avesta, the old book of Zoroastrianism mentions Herat as "Haroyu" and lists it as the sixth land of the sixteen perfect lands created by Ahura Mazda, the Zoroastrian god. In Achaemenid times (ca. 550-330 BC), the surrounding district was known as "Haraiva" (in Old Persian). Ancient Greeks called it "Aria" and "Artacoana" was the capital of Aria. Alexander the Great took Artacoana in 330 BC and destroyed it. He later built another city near Artacoana and named it "Alexandria in Ariana", today's city of Herat. After him Parthians and Sassanians took over. Sassanians called the city “Harēv”. Arabs took Herat in 660 AD, and it became a center of the Muslim world. Herat has a long history as a centre for sufism, the mystical branch of Islam. It became part of the area then known as Khurasan, which reached its peak of civilization in the twelfth century. In 1221 AD, it was taken by the Mongols and later destroyed by Genghis Khan and Timur, the Turkic conqueror, took it in about 1393 AD. Herat’s greatest era was during the Timurid rule, when it was a centre of science and culture. As the capital of the Timurid empire, it boasted many fine religious buildings and was famous for its sumptuous court life and musical performance and its tradition of miniature paintings. Later Persians and Afghans fought over the control of the city and Herat changed hands several times before it (under British interference) permanently became part of Afghanistan in 1857 under the Treaty of Paris. In March 1979, an anti-Communist uprising in Herat, left 25,000 civilian deaths. Between 1978 and 1992, communist forces in Herat city fought resistance forces holding the countryside. In 1995 the area came under the control of Pashtuns of the Taliban movement. After the United States' invasion of Afghanistan, on November 12, 2001, it was liberated from the Taliban by the Northern Alliance. These days, unlike other places in Afghanistan, Herat is safer.